We were deeply saddened to hear that Mark Fisher, the cultural theorist, died last week. When we were starting the Bioskop in early 2010 I went (almost randomly) to a talk by Mark on his recently published book Capitalist Realism. It was a shock – and a wake up call – and led on to discovering (belatedly) his blog k-punk, and Zero Books where he was commissioning editor at the time. Some great writing about Mark has appeared in the last few days, by friends and colleagues including this by Robin MacKay and this by David Stubbs. A much longer version of this post with personal reflections can be found here. Photos, video and background documenting this event are now up on the love page. So… What did happen after they lived happily ever after? 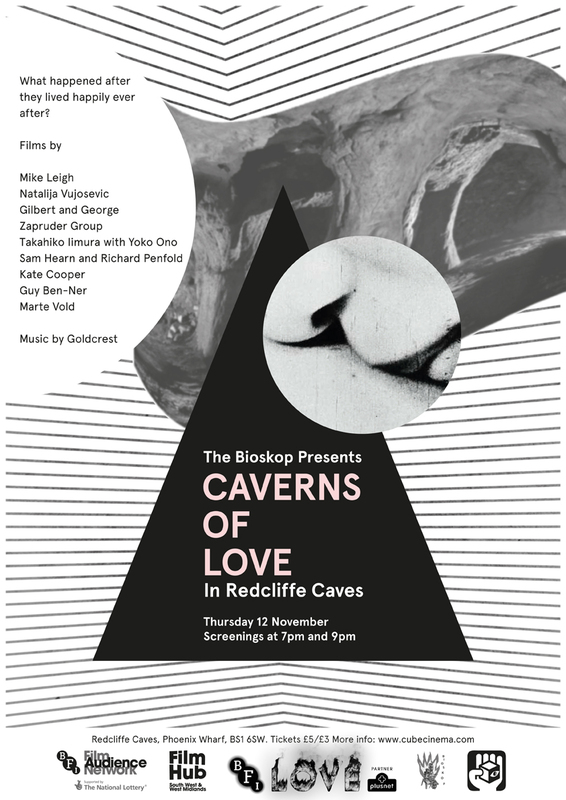 Forget first love, forget head over heels, forget the fluffy stuff, lets look at the glistening grit that lies at the centre of real relationships… Come with the Bioskop deep into Redcliffe Caves on a cinematic journey and discover the answers to the questions you didn’t even want to ask… A selection of nine short films and live music from Goldcrest. Screenings at 7pm and 9pm. Tickets available at the cube website. Come along! What is that? An inducer? What, did it fall off? / Ummm… How do you…? // Let me see that again… I think I have it. / Hey give me your arm. / Ummm… you know… when I was at school it was all very different. We used to stay in bed all the time. / Combined Primary Economics. / Combined Primary Economics was a bottle about this big. Took a week. The Bioskop presents the UK cinema premiere of Frances Stark’s feature length animation My Best Thing at the Cube on Valentines Day, 14/2/13. 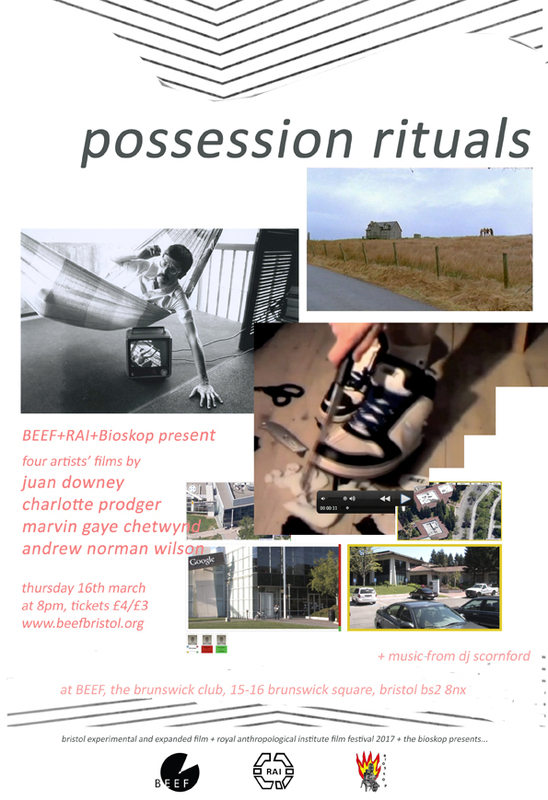 Plus music from Mr_Hopkinson’s computer, and LTA (Live Timeline Actions) will be creating a deterritorialised performance on the stage. 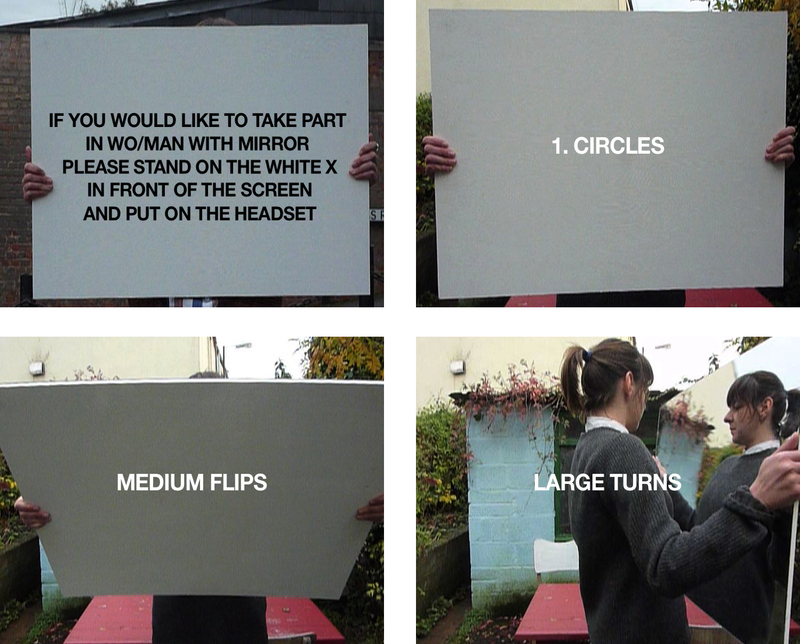 More details here, and we’ll be posting background to the film and event on our valentine page. nb to see the programme of films we showed on the night go to the family page, here. The bioskop is heading to the Star and Shadow in Newcastle on Thursday 21st January to screen a programme we’ve assembled of artist’s film, rare documentary, and short fiction called WE ARE FAMILY. As well as being the bioskop we’re very proud to be part of the collectively-run Cube Cinema , which is a kind of a sister cinema to the Star and Shadow. The two cinemas are very similar in the way they work, active at opposite ands of the country but sharing a lot of ideological and organisational DNA. We’ve never been to the Star and Shadow so we’re going to screen each of the films in a different room – hopefully including the bar, auditorium, office and smoking area – so that we and the audience get a chance to explore. If you’ve ever been part of a collective (or any work organisation) you’ll know the experience is a mixture of friendship, arguments, politics, flirting, work and shirking, endless meetings, egos, emails, inspiration and disillusion (and vice versa), drinking, cleaning, boredom and fun. 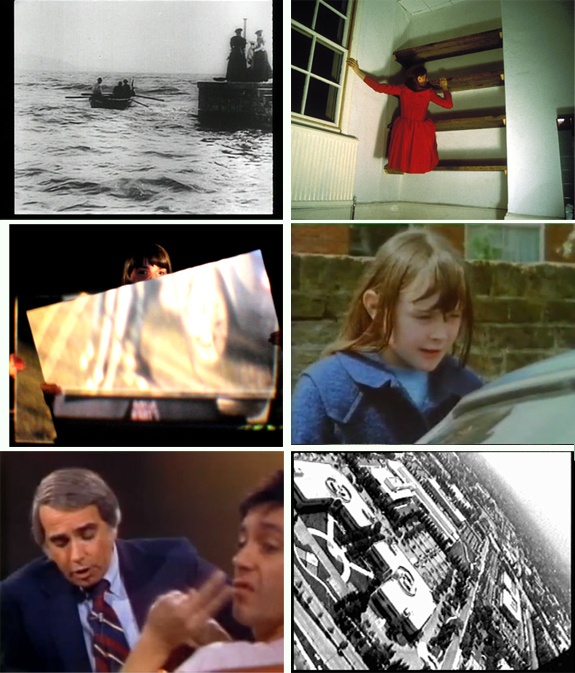 Below are stills from an instructional video the bioskop made so that audience members could step into the light beam and perform with sheri guywin (our take on Guy Sherwin’s Man With Mirror). Bioskop friends LTA (Live Timeline Actions) hooked up a broadcast system so that instructions could be passed onto the performers via headsets. We’ve posted articles, photos, the films shown, performance footage… and the saga of the location(s) on the institution page of this site. The Bioskop’s mysterious drifting cinema returns (with a new generator) for a free! 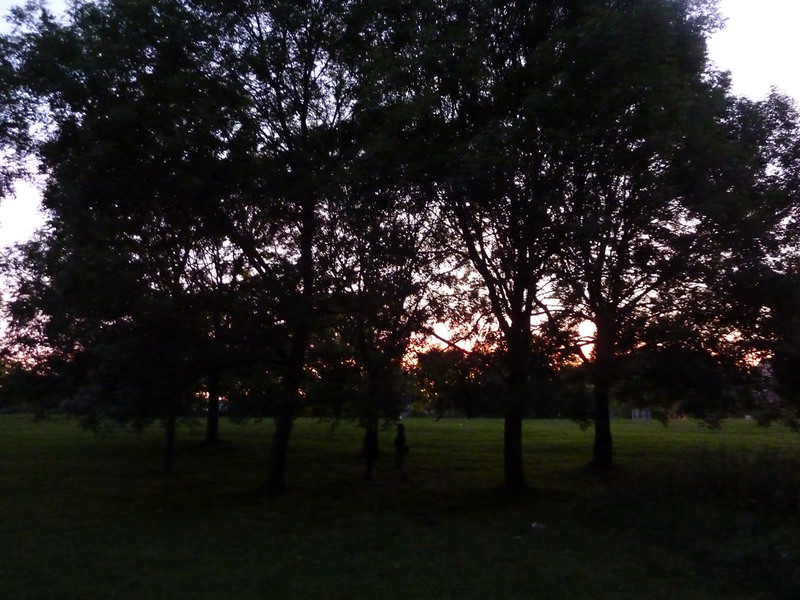 secret event starting at 7.30pm/sunset on Sunday 26th August – VAGABOND 2. We’ll post directions for how to get to the event, on this page on the day. If you want to get an email with the location – drop us a line at bioskop@cubecinema.com. We’re going to be at a festival in early August. The Bioskop aren’t too sure about Festivals. They seem to have morphed into gated communites/malls for middle class people on un-inspiring drugs. Why the wicker man in St Werburghs? 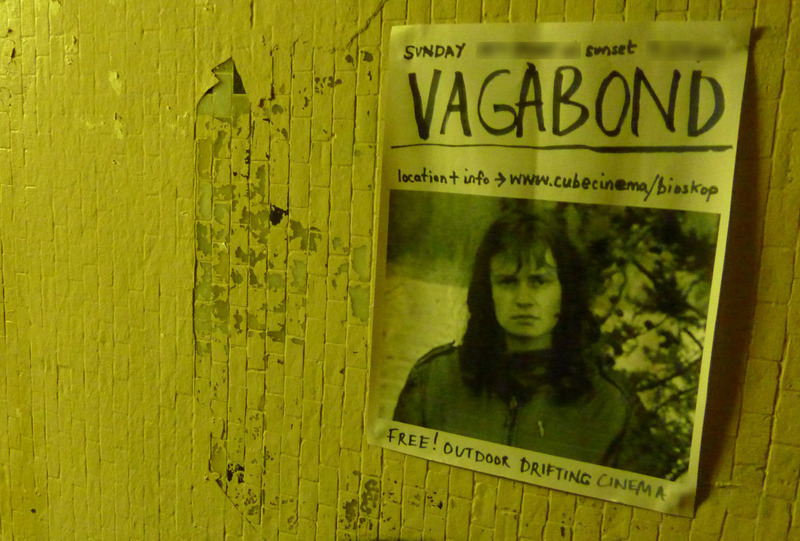 where is the vagabond cinema?